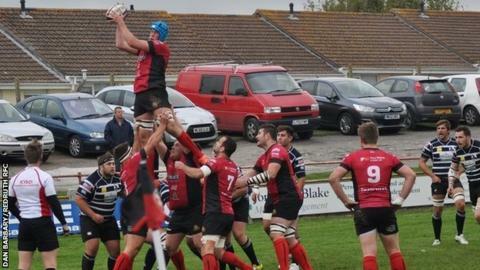 Redruth are capable of being a top-four side in National Two South, according to head coach Steve Larkins. The Reds are seventh, having won five of their opening eight matches, and host Canterbury on Saturday. "If we can win one or two more games then we'll jump into that top-four bracket," said Larkins. "We're definitely good enough to push every team in this league and the way we're playing, especially away, we deserve to be in the top four." The Reds won their opening three games of the season and topped the table before being overtaken, but Larkins is convinced that his side just need small tweaks to return to winning regularly. "It's a bit of consistency, really, and ironing out the small errors," he told BBC Radio Cornwall. "The major things have been going well, our set-piece has been going well, our attack is going well, but the odd decision sometimes ends up costing us. "Overall, it's been a really good start to the season and everyone in the squad and the coaching staff is pretty happy with how it's going."